The government is considering setting up a new bank to invest in start-up and high risk business ventures. Prime Minister Gordon Brown said he would look at the case for setting up such a bank, targeting hi-tech firms. He said the proposed bank would "provide the finance for more difficult and more risky start-ups for high-technology businesses of the future". Earlier a business investment group warned that many young high-tech companies were under threat. The National Endowment for Science, Technology and the Arts (Nesta) said government funding was needed as the credit crunch threatened a generation of small high-tech companies. It said that there was a 70% fall in new venture capital funding last year and warned that the UK could lose its global standing in areas such as healthcare and biotechnology. Nesta called on the government to go half-and-half with the private sector to provide £1bn for high-tech investment. 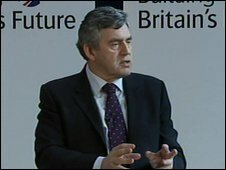 Prime Minister Gordon Brown said he would be examining the case for setting up "a bank for industry and innovation". One of the options to be considered would be a public-private partnership scheme similar to the Industrial and Commercial Finance Corporation (ICFC). The ICFC was a partnership between the Bank of England and major banks, set up in 1945 to provide funding for small and medium-sized companies. Last month, Richard Lambert, head of the employers' group the CBI, called for an investment corporation like the ICFC to be set up. The prime minister made the announcement while launching a report called New Industry New Jobs, which said that government needed to recognise the impact that decisions on taxation and spending have on the development of British businesses. "This means making Britain's economic and industrial renewal the remit not just of the Department for Business, but of all Government departments," the report said. The government has said that decisions on the funding of academic research will take greater account of its economic impact. Nesta's report identified healthcare, green technology and digital media as sectors where the UK could lose its leading international status unless the government offered support. It also urged Chancellor Alistair Darling to use the government's multi-billion fiscal stimulus package to support lending to companies working on new technologies. It said: "The effects of not investing in these sectors are serious. "If the innovative capacity of our healthcare sector weakens, over £8bn worth of pharmaceutical exports and over £1bn of domestic sales could be lost annually. "The cost to the NHS and to society in terms of poorer health outcomes would be considerably larger," the report concluded. Meanwhile, a minimum wage freeze has been called for by business leaders as part of measures to help private industry drive the economy out of recession. The British Chambers of Commerce wants more supportive measures for firms in the forthcoming Budget, including cutting small businesses' corporation tax.